I need to be a practice partner like Ellery. She was so darling with Callista. Callista begs to play the piano, but my policy is no lessons until they are six. I can only handle practicing with one at a time. Yesterday I caught them practicing together and had to snap a picture. It made me laugh as Ellery tapped the piano with her pencil, starred songs when Callista passed them off, awarded music bucks, and scheduled a recital. But most impressive was how patient and positive she was. A good lesson for this particular practice partner. Berkeley went to the doctor yesterday. We were so proud she weighed 6 lbs 6 oz. She is officially in the heavy weights now. She is one month old today. It is amazing however, she feels only a week old to me. All those days in the hospital are hazy and receding away. I am grateful I recorded them, someday I may want to read them again. Not for awhile though. Too raw. 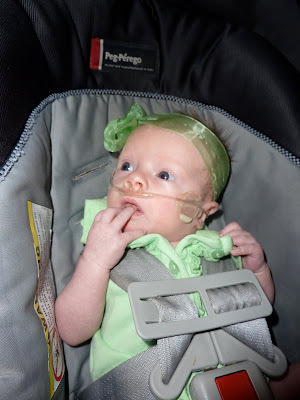 The doctor did not try taking Berkeley off her oxygen, as her saturation levels were borderline low. Her doctor actually turned the flow up a bit. I dreamt she went back on CPAP last night. Ughh. In two weeks we will try with the oxygen again. Thankfully, they told me I can forgo the horrid leads which false alarm constantly and present far too many cords. Hooray. We only will use it when she starts sleeping for prolonged periods. My three little girls were hanging out together this morning. Berkeley is so much more portable minus the leads and monitor. Callista especially just adores holding Berkeley. She also loves playing "games." The games must be closely monitored as they usually involve some sort of wild rocking or bouncing. Walking. Oh can I tell you how happy that would make me! 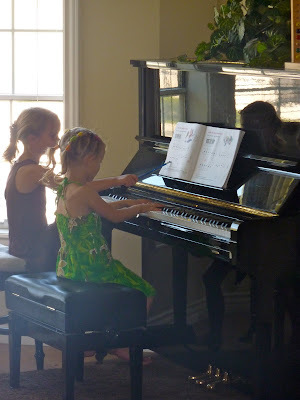 How sweet, I love the picture of the girls doing piano lessons together, so sweet! I'm so glad Berkeley is gaining weight, that's wonderful!! She's adorable and we are so happy she's home.